I don't quite know what to do with this new section of mine. I originally planned on doing stories of history about where I'm from but then I decided to do something different and make it more of a grab-bag type of thing but then I realized that there's no way I could do different stuff every other week or so but that may be a future thing if I can think of stuff to do. Then I thought about not even starting the new section until I could definitely come up with something to put in it but then I came back to the history thing. Always to the history thing. So, here are three short histories from where I am from. If you like it or hate it, let me know. 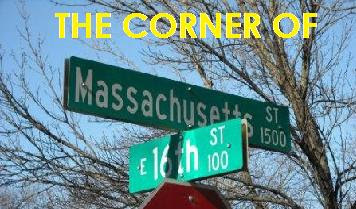 "The Corner of 16th & Massachusetts" makes it's official debut in mid-January just so you're prepared. Fifteen miles southwest of Lawrence, along a road known as the Lawrence, Bloomington, Clinton and Emporia Trail, a few families settled in an area near Rock Creek in late 1854. The small community was disected diagonally by the trail and a look at a map of the area, County Roads 6 and 1023 follow virtually the same route. In 1856, a Scottish immigrant settled a few miles southwest of the small community and established the St. John's Catholic Church and started a small cemetery. After numerous other Catholic settlers came to the area, it was learned that when Rock Creek would flood, it would keep people on the south side from attending church or visiting the cemetery so the church was moved to a new location near Lapeer which is now the St. Francis of Assisi Catholic Church. The foundation of the old church is still visible in the southwest corner of the Rock Creek Cemetery. By 1869, the small community was it's own separate entity from nearby Clinton and Twin Mound and was named Belvoir after Fort Belvoir in Virginia which was chosen by Lawrence D. Bailey. Bailey immediately decided that a schoolhouse should be built and in 1865, the school was completed for a cost of $1,500. Because of Belvoir's proximity to Clinton and Twin Mound, there was no post office until 1868. However, in 1873, Belvoir moved to two and a half miles north where a new railroad had been constructed. Only the Belvoir School remained open while the rest of Belvoir's businesses moved to New Belvoir. The first school in New Belvoir was constructed in 1874. The railroad quickly went out of business, the post office closed in 1874 and reopened briefly between 1888 and 1903 but New Belvoir remained a small country town until construction on Clinton Lake began. Ironically, New Belvoir had to be demolished and is now underwater while old Belvoir remains above water. Information gathered from Soil of Our Souls by Martha Parker and Betty Laird, Parker-Laird Enterprises 1976, 1994. Photos by author. Standing alone and abandoned in a field north of Lawrence but just south of Midland is a beautiful stone house with detailed Italianate windows, roofs and chimneys. The Vermilya-Boener house stands as a testament to Elijah and Cynthia Vermilya, early settlers of Douglas County. The Vermilya family moved to Douglas County in 1866 and lived in a log cabin while William worked with Swedish stonemasons to construct the Italian Villa-style house that now stands on the property. The building remained in the Vermilya-Boener family until it was sold in the mid-1950s and was used as a residence until 1948. It has remained vacant since. Ella, Elijah and Cynthia's daughter, married William Boener in 1891 and lived in the house until 1893 when they moved to Lawrence but they returned in 1900. William died in 1903 and Cynthia died in 1905 and Ella and her three children continued to live in the house until sometime after 1915. Ella's son Julian then took up residence in the house with his wife and family until 1948 when they moved to California. William Boener opened a grocery store in Lawrence on Massachusetts Street in 1891 but sold it in 1893 and established the Boener Brothers Cigar Factory which was originally located at 700 Massachusetts but soon moved to a bigger location in the 600 block. Boener Brothers went out of business in 1920 due to increased competition from cigarettes and Eastern cigar makers. The house itself has lost much due to it's current state. The main staircase no longer exists but the condition of the original woodwork and the stone walls are quite good while the non-load-bearing interior walls display their age. Information provided by the National Register of Historic Places Nomination sheets. Photo by the author. The Vermilya-Boener house can be found here. Information from The Bald Eagle Vol. 17, No. 2, Summer 1991. Published by the Lecompton Historical Society. Article written by Sara Walter, researched by Iona Spencer. Photos by the author except for the drawing which is by Ellen Duncan.